Wearing a harness the performer lies on the floor as the physical counterweight to a theatre light, which casts a wide blue circle. Lying within this light the performer wears heavy silver eyelashes, which prevent her from opening her eyes. Not being able to use her eyes she scans her environment with her hand, advancing inch by inch. 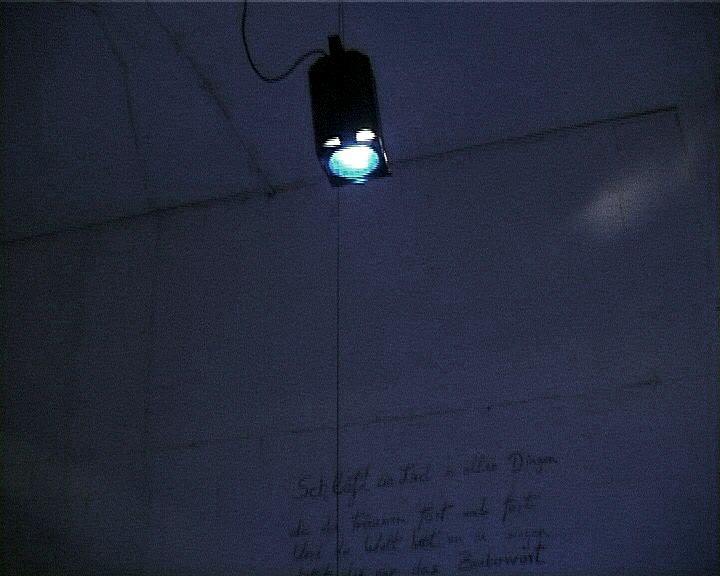 The painfully slow and laborious movement on the floor is offset by a romantic poem that is written on the walls, both in the original German and translated into Hebrew. Composed by the romantic novelist and poet Joseph Freiherr von Eichendorff it proposes that one only needs the magic word for things to release their song. West London Collaborations, QUEEN MARY UNIVERSITY, London 2001.